Utah sensation THE PIANO GUYS return with their all-new album Limitless today – available everywhere now. On Limitless, The Piano Guys showcase their talent for reinventing the music of any genre, from contemporary pop and rock hits to classical compositions, Hollywood scores and even never-before-heard originals. 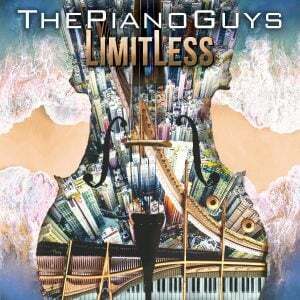 The newest release from The Piano Guys lives up to the name Limitless as the foursome once again leapt past boundaries for the 13-track collection. The album’s title track “Limitless” sets the groundwork for the breadth of the album, ebbing and flowing from cinematic piano into expansive strings underscored by percussive cello sounds. Featuring the guys’ take on the latest pop hits, Limitless includes a new recording of Shawn Mendes’ hit single “In My Blood” as well as their previously released cover of Ed Sheeran’s “Perfect,” a fan-favorite that has garnered nearly 20 million views on YouTube alone. Expanding their reach far beyond the American pop music scene, the foursome are also taking on K-pop with their covers of “DNA” and “Epiphany” from global K-pop superstars BTS. Known to bring music of different genres together for a sound all their own, Limitless also features their mash-up of The Chainsmokers’ Coldplay-featuring hit “Something Just Like This” with Franz Liszt’s “Hungarian Rhapsody No. 2.” Rounding out the collection are recent favorites from the award-winning film The Greatest Showman (“Rewrite the Stars” and “A Million Dreams”) as well as original compositions (“Limitless,” “North Cape,” “First Dance,” and “Miracles”), culminating in a diverse new album that’s sure to have multigenerational appeal. Since formally introducing themselves in 2011 on YouTube, The Piano Guys – Steven Sharp Nelson, Jon Schmidt, Al Van der Beek and Paul Anderson – unassumingly arrived as a musical phenomenon. Over the course of five studio records, two Christmas releases, and a fan favorite live album, they have impressively tallied 2 billion-plus global streams, clocked upwards of 1.6 billion YouTube views, earned six No. 1 debuts on the Billboard Top Classical Albums Chart, sold out concerts in almost every corner of the world, averaged nearly 2 million monthly listeners on Spotify, and attracted a diehard audience. Not to mention, they’ve appeared in The New York Times, Fast Company, BuzzFeed, Mashable, and People, were featured on CBS Sunday Morning and performed on the TODAY Show, Good Morning America and The Tonight Show. FOR THE LATEST TOUR DATES AND TICKETS PLEASE VISIT THEPIANOGUYS.COM.